Tradition is serious business come the holidays. There are some traditions that people will just not let go. In my family, for example, we have jellied cranberry sauce on Thanksgiving. The kind that jiggles out of the can. The kind that I, as a food blogger, probably should not be professing my love for in this very public space. But there you have it: This shameful dish has been on our Thanksgiving table for as long as I can remember, and I love the stuff. Other traditions come and go, no matter how hard you want to hold on. Marriage will do these kinds of things, so that holiday traditions are doubled, tripled, quadrupled. And even though it can be tough splitting holidays between families, missing one Christmas morning for another, and spending another Thanksgiving without certain faces, there is something to be said for making brand new traditions that just might stick, and to embrace the traditions that are gifted from others. I love hearing about other families' traditions. About annual hikes on Thanksgiving mornings, and special wrapping paper used only for Santa's gifts. About stockings, and lists, and Alaskan King crab dinners on New Year's Eve. About the best banana cream pie ever, and that favorite meal of leftovers enjoyed the day after Thanksgiving. *Note from Leslie: My dad's favorite meal on Earth. Best enjoyed the day after Thanksgiving. This recipe is adapted from my cook.eat.smile recipe book. Just like most family recipes, the original had few exact measurements. Below are the measurements I used, with the addition of green pepper and garlic. The results were delicious. That sauce! I could bathe in it. Thanks, Les! Melt butter in a large skillet over medium-high heat. Add onions, green peppers, and garlic, and cook for a few minutes until soft. Add potatoes, turkey, paprika, salt, and pepper. 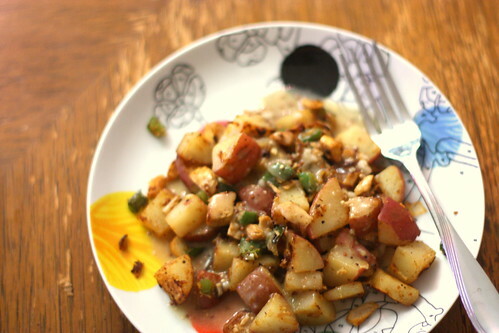 Cook everything until brown and potatoes are done to your tastes. I cooked mine until browned and slightly crispy. In a small saucepan, heat the broths to a simmer over medium-low heat. Whisk in mustards until combined. Add flour and butter to desired thickness. * Adjust to taste. Pour sauce over hash and enjoy! Mmmmmm. *The butter and flour are for thickening purposes. Just make sure you have equal parts. You may use more or less depending on how you like the sauce. I could have sworn I left you a comment on this already, but perhaps I was just thinking about leaving one...so here's one now. I made the sauce and it was sooo good over simple roasted potatoes (the hubby took the turkey to work). Dang! If only I had this recipe when there was turkey left. Sounds delicious. Stephanie - I could drink that sauce for breakfast. It would definitely go great with anything! So glad you tried it! 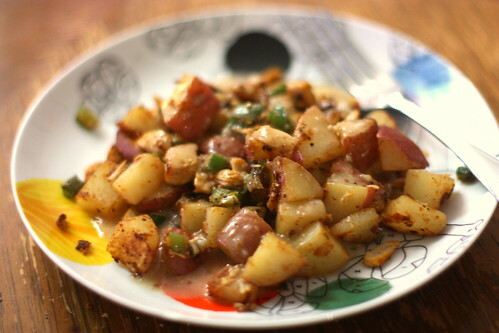 Nicole - If you can't make the turkey hash, make regular hash with whatever you have on hand and pour the sauce over it. Or make it with leftover ham. I may have dipped leftover ham straight into the container of leftover sauce last night and ate it straight. It's that good. I can relate to what you're saying about traditions; I've just started splitting holidays with my S.O. 's family, too, and I'm as sad about missing my own family's Christmas traditions as I am excited to be a part of someone else's. All that aside, this hash looks good enough to be repeated year after year! Yum. I've finally got leftover turkey this year (my MIL gave me the carcass along with the meat from their Christmas dinner), so this recipe sounds perfect to me. Mustard sauce? Sounds like a new tradition!